The ChunkGeneratorNode creates chunks of landscapes and entities. The chunks are added to the scene as children of a chunk container game object. Update This button triggers an update of the chunks in the scene. Existing chunks are not replaced. Clear This button clears all chunks from the scene. Auto Update If this checkbox is checked the node updates the chunks automatically if you move the request center. This can be used to work on chunks live in edit mode. chunk Connect a node that defines a chunk like the ChunkNode. chunk size The x and z size of a chunk. req. radius The radius to create chunks relative to the request center. Notice: do not use high values because it can lead to heavy computations. seed The seed for the chunk. request center The request center to create chunks. The transform position of a game object is used. The game object could be your player or the camera. 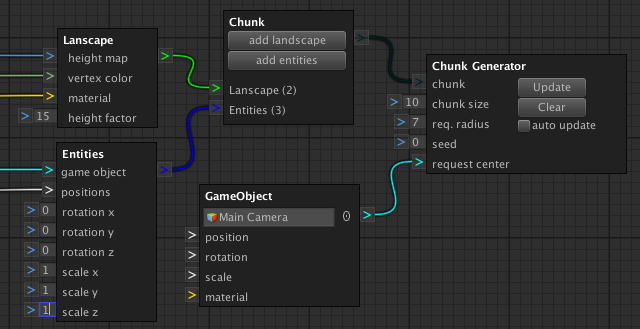 Adds chunks to your scene as children of a chunk container game object.